This is what I term “seeding” a new duckweed pond. You are looking at 20 gallons of fresh duckweed being released in a one acre pond. It’s not nearly enough duckweed as a proper seeding should result in an evenly covered initial surface. I will give it another dose tomorrow. Note: This pond is man-made and isolated from any creeks or waterways. Always an important point to consider when siting or repurposing an existing pond. I had to take a long tree branch and gently break up the lumps of duckweed to insure that all of the fronds have a chance to survive. In the past, I’ve not done this and the duckweed in the center of the clumps died. Waste of good plants. The gentlest way to do this is to push the lumps under the water and move around slowly. The fronds (leaves) have pockets of air in them and once freed from the tangled mass, head up to the surface right side up. Beating lumps apart just breaks roots, damages fronds and hurts newly transplanted duckweed more than it helps. 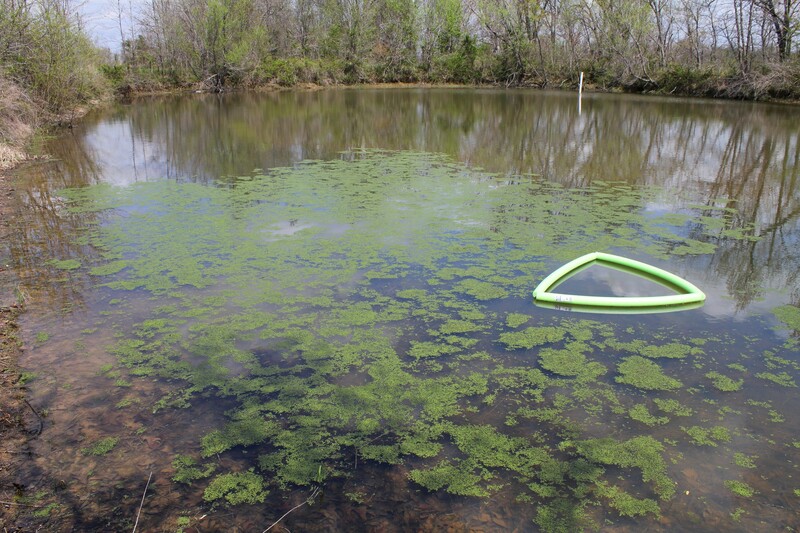 The foam triangle is from a week-long test I did to discover the primary wind direction as well as just how tasty duckweed is to the local wildlife. I know now which side of the pond needs a bit of tweaking for more protection from the wind. I was also happy to see that little if any duckweed disappeared in the taste experiment. I learned a great deal just by observing how the duckweed behaved. Some of it leaked out of the triangle and hugged the shoreline in clusters. Very interesting how it seems to congregate rather than drift away as individual plants. I’d seen that in my kiddy pools but attributed it to the relatively small dimensions of the pools themselves. Now in a one acre setting, individual fronds still cluster together, despite the enormity of their surroundings. Sort of like human behavior! Congrats on starting the duckweed operation. Intersting comments on duckweed “plant behavior”. When kids are in a new place, they tend to stick together. When they get braver, they’ll spread out.